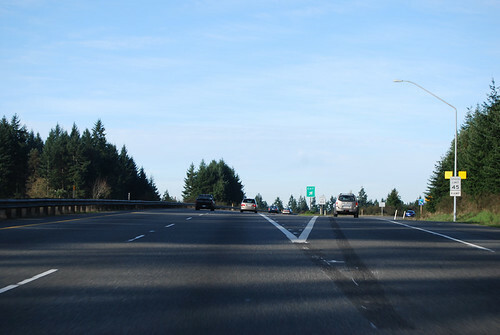 On Sunday, November 23, 2008, we drove the length of Highway 16, from Tacoma to Gorst. The best part was the Tacoma Narrows Bridge, but there's no photo of that on this page. You'll have to look at my other trip report for those. 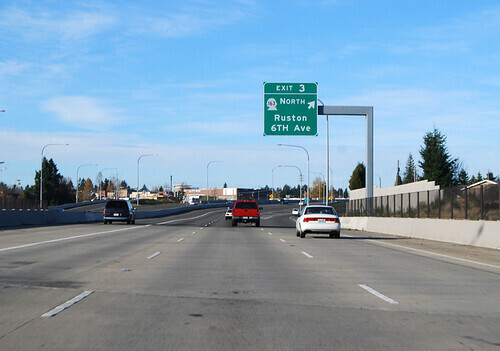 Beginning at a junction with state route number 5 at Tacoma, thence northwesterly by way of the Tacoma Narrows Bridge to a junction with state route number 3 in the vicinity of Gorst. 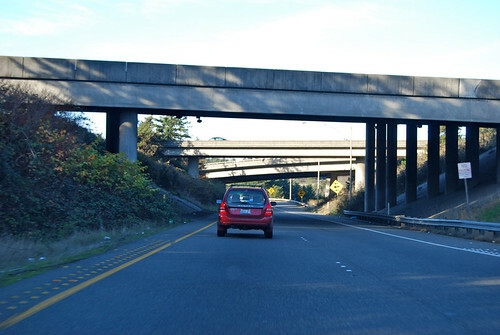 We approached the end of SR 16 from the south, so I could cross under I-5. And away we go! In west Tacoma, the junction with SR 163, which is one of the land-and-water highways, taking you to the south end of Vashon Island. . . . Why did they capitalize the "TH" in "6th"? 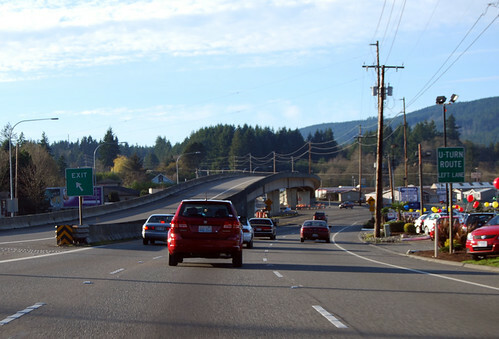 After crossing the Narrows Bridge and flying past Gig Harbor, Highway 16 swerves around the town of Purdy. Take SR 302 if you want to actually go there. 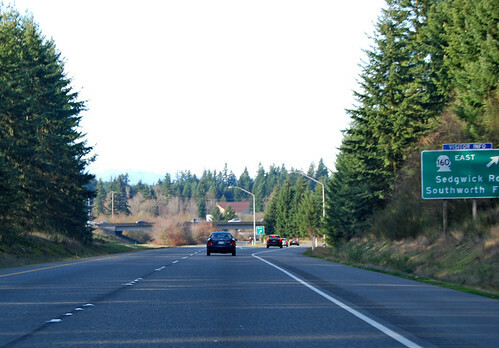 A few minutes later, we're at SR 160, the exit for Port Orchard. 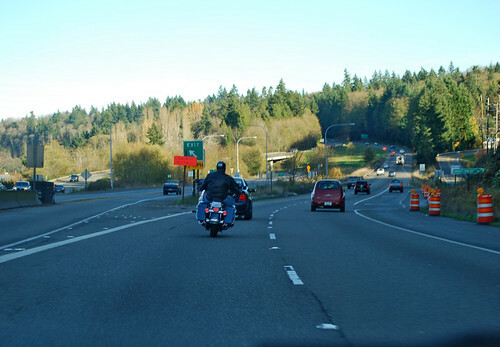 Actually, SR 160 heads to the north end of Vashon Island and on to Seattle, so that's another land-and-water highway. For what it's worth, Vashon Island is only served by state highways at the north and south ends, with no actual land highway between. A bit odd, if you ask me. Shortly, the road goes down the hill toward the body of water called Sinclair Inlet. 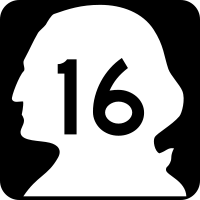 Before I knew it, we had passed the junction with SR 166. It didn't have an exit! How was I to know? Well, I guess my map-reading skills weren't up to snuff today. So we snapped this shot on the way back. And then we come to Gorst and SR 3. We wound up driving north on 3 for a few miles, trying to find a place to turn around. Nice views of the water and mountains, so not really a problem. I exited on SR 304, and then had to go another mile before I could U-turn. I guess the road designers really want you to keep going to Bremerton. But we didn't go there. Ha. A rather anticlimatic drive, actually. 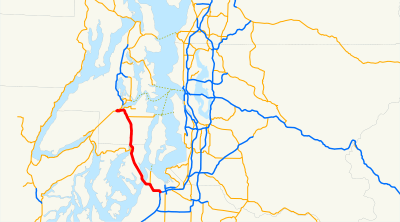 Yes, it is odd that they did not include the main north-south highway on Vashon Island as a state highway. You are quickly coming up on highway 20, which has mountain passes that close for the winter soon. I hope you can make it in time, or your progress will c ome to a halt until next April or so.